OXFORD, Miss. – For the first time, scientists have directly detected gravitational waves – ripples in space and time – in addition to light from the spectacular collision of two neutron stars. This marks the first time that a cosmic event has been viewed in both gravitational waves and light. The discovery was made using the U.S.-based Laser Interferometer Gravitational-Wave Observatory, known as LIGO, the Europe-based Virgo detector, and some 70 ground- and space-based observatories. Neutron stars are the smallest, densest stars known to exist and are formed when massive stars explode in supernovas. As these neutron stars spiraled together, they emitted gravitational waves that were detectable for about 100 seconds; when they collided, a flash of light in the form of gamma rays was emitted and seen on Earth about two seconds after the gravitational waves. In the days and weeks following the smashup, other forms of light, or electromagnetic radiation – including X-ray, ultraviolet, optical, infrared and radio waves – were detected. “This is really the beginning of multimessenger astronomy,” said Marco Cavaglia, professor of physics and astronomy at the University of Mississippi and principal investigator of the Ole Miss LIGO group. “Since the time humans have first gazed at the sky, people have just relied on light to learn about the universe. 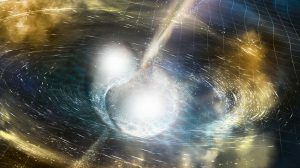 The observations have given astronomers an unprecedented opportunity to probe a collision of two neutron stars. For example, observations made by the U.S. Gemini Observatory, the European Very Large Telescope and NASA’s Hubble Space Telescope reveal signatures of recently synthesized material, including gold and platinum, solving a decades-long mystery of where about half of all elements heavier than iron are produced. The gravitational signal, named GW170817, was first detected at 7:41 a.m. Aug. 17; the detection was made by the two identical LIGO detectors in Hanford, Washington, and Livingston, Louisiana. The information provided by the third detector, Virgo, situated near Pisa, Italy, enabled an improvement in localizing the cosmic event. At the time, LIGO was nearing the end of its second observing run since being upgraded in a program called Advanced LIGO, while Virgo had begun its first run after recently completing an upgrade known as Advanced Virgo. The National Science Foundation-funded LIGO observatories were conceived, constructed, and operated by Caltech and MIT. Virgo is funded by the Istituto Nazionale di Fisica Nucleare in Italy and the Centre National de la Recherche Scientifique in France, and operated by the European Gravitational Observatory. Some 1,500 scientists in the LIGO Scientific Collaboration and the Virgo Collaboration work together to operate the detectors and to process and understand the gravitational-wave data they capture. Each observatory consists of two long tunnels arranged in an “L” shape, at the joint of which a laser beam is split in two. Light is sent down the length of each tunnel, then reflected back in the direction it came from by a suspended mirror. In the absence of gravitational waves, the laser light in each tunnel should return to the location where the beams were split at precisely the same time. If a gravitational wave passes through the observatory, it will alter each laser beam’s arrival time, creating an almost imperceptible change in the observatory’s output signal. On Aug. 17, LIGO’s real-time data analysis software caught a strong signal of gravitational waves from space in one of the two LIGO detectors. At nearly the same time, the Gamma-ray Burst Monitor on NASA’s Fermi space telescope had detected a burst of gamma rays. Rapid gravitational-wave detection by the LIGO-Virgo team, coupled with Fermi’s gamma-ray detection, enabled the launch of follow-up by telescopes around the world. The LIGO data indicated that two astrophysical objects located at the relatively close distance of about 130 million light-years from Earth had been spiraling in toward each other. It appeared that the objects were not as massive as binary black holes – objects that LIGO and Virgo have previously detected. Instead, the inspiraling objects were estimated to be in a range from around 1.1 to 1.6 times the mass of the sun, in the mass range of neutron stars. A neutron star is about 12 miles in diameter and is so dense that a teaspoon of neutron star material has a mass of about a billion tons. “The scientific community has been eagerly awaiting this moment,” says Kate Dooley, UM assistant professor of physics and astronomy and a member of the LIGO team that designed and built the detectors. Theorists have predicted that when neutron stars collide, they should give off gravitational waves and gamma rays, along with powerful jets that emit light across the electromagnetic spectrum. The gamma-ray burst detected by Fermi, and soon thereafter confirmed by the European Space Agency’s gamma-ray observatory INTEGRAL, is what’s called a short gamma-ray burst. The new observations confirm that at least some short gamma-ray bursts are generated by the merging of neutron stars – something that was only theorized before. “This result is a great example of the effectiveness of teamwork, of the importance of coordinating and of the value of scientific collaboration,” said Federico Ferrini, director of the European Gravitational Observatory. “We are delighted to have played our relevant part in this extraordinary scientific challenge: Without Virgo, it would have been very difficult to locate the source of the gravitational waves. Each electromagnetic observatory will be releasing its own detailed observations of the astrophysical event. In the meantime, a general picture is emerging among all observatories involved that further confirms that the initial gravitational-wave signal indeed came from a pair of inspiraling neutron stars. Approximately 130 million years ago, the two neutron stars were in their final moments of orbiting each other, separated only by about 200 miles and gathering speed while closing the distance between them. As the stars spiraled faster and closer together, they stretched and distorted the surrounding space-time, giving off energy in the form of gravitational waves before smashing into each other. Theorists have predicted that what follows the initial fireball is a “kilonova,” a phenomenon by which the material that is left over from the neutron star collision, which glows with light, is blown out of the immediate region and far out into space. The new light-based observations show that heavy elements, such as lead and gold, are created in these collisions and subsequently distributed throughout the universe. 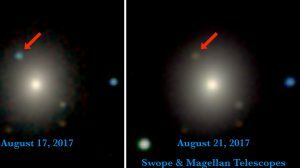 In the weeks and months ahead, telescopes around the world will continue to observe the afterglow of the neutron star merger and gather further evidence about various stages of the merger, its interaction with its surroundings and the processes that produce the heaviest elements in the universe. “Gravitational wave astronomy continues to provide exciting new ways to observe our universe,” said Josh Gladden, UM interim vice chancellor for research and sponsored programs. “A particularly exciting aspect of this discovery is that this event could be observed by both traditional electromagnetic (light) astronomy as well as by gravitational waves, which allows for direct comparisons. LIGO is funded by the NSF, and operated by Caltech and MIT, which conceived of LIGO and led the Initial and Advanced LIGO projects. Financial support for the Advanced LIGO project was led by the NSF with Germany (Max Planck Society), the U.K. (Science and Technology Facilities Council) and Australia (Australian Research Council) making significant commitments and contributions to the project. More than 1,200 scientists and some 100 institutions from around the world participate in the effort through the LIGO Scientific Collaboration, which includes the GEO Collaboration and the Australian collaboration OzGrav. Additional partners are listed at http://ligo.org/partners.php. The Virgo collaboration consists of more than 280 physicists and engineers belonging to 20 different European research groups: six from Centre National de la Recherche Scientifique in France; eight from the Istituto Nazionale di Fisica Nucleare in Italy; two in the Netherlands with Nikhef; the MTA Wigner RCP in Hungary; the POLGRAW group in Poland; Spain with the University of Valencia; and the European Gravitational Observatory, the laboratory hosting the Virgo detector near Pisa in Italy, funded by CNRS, INFN, and Nikhef.